No picture today, just an up date that I’m off today for a two week cruise out of Fort Lauderdale on the “Oasis of the Seas”. a fellow at the hotel – which is the Ramada and is a dump – noticed a bunch of SAR techs – we have these round-the-neck name tags. He want up to one and said he’d known a guy who became a SAR tech – Mike Simpson. The person he spoke to said no Mike wasn’t here, but his widow was. The guy came and found me. Turns out he served with Mike in the RCD in Germany and he remembered me coming to do PE in the mornings with them. He recalled I “ran their asses into the ground”. I actually don’t recall that – my recollection was the other way around. Still the point is how small a world and how nice that he took the time to come say hello. SO on that positive note begins this segment of the adventure. So how very cool is this. 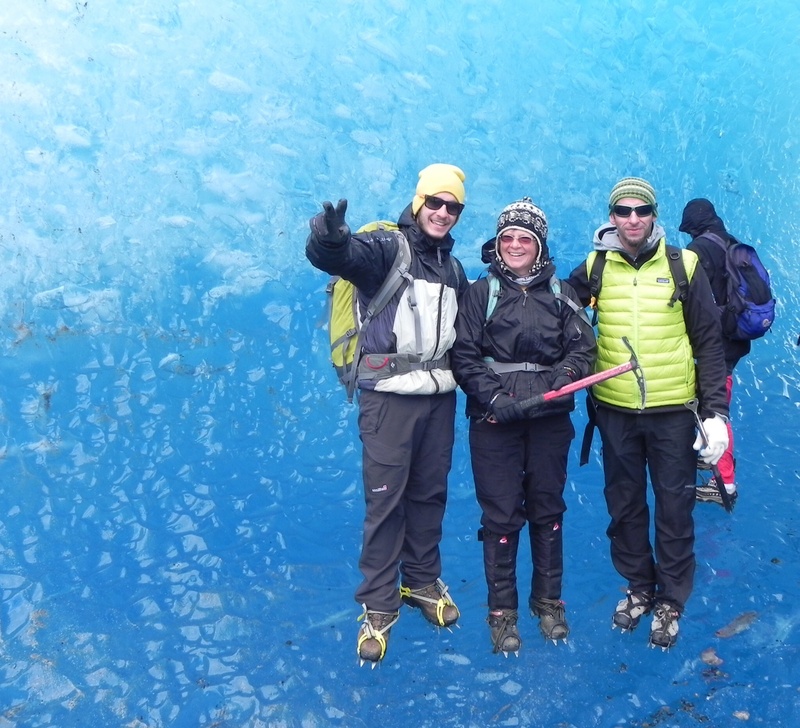 Me and two of our three guides are inside an ice tunnel within the glacier. We spent the morning tramping around the glacier – mostly on its surface which seemed to be either ups or downs with not too much level ground. As you can see we were wearing crampons for the obvious reason – the glacier was very slippery! The ups were fairly easy but the downs took some getting used to. Crampons do not work like skis for obvious reasons. My mantra was “trust the crampons, trust the crampons” a slip would not have been fun. In some of the steeper sections the guides cut steps into the ice with the ice axes – for which I was most grateful. So in case anyone is wondering – horses are good climbers. Yesterday I went for another ride – I really am pretty hooked on Patagonian trail riding. We started at the end of the valley you can see in the picture and climbed up a very steep hill side – to this look out. I’d be very untruthful if I didn’t admit to being more than slightly scared! But trusting the horse to be sure footed was pretty much all I could do. The view was worth while and the return ride not nearly so scary as we went a different route. At the end of the ride we came to a really level long flat stretch – almost like a grassed over old runway – anyway that was awesome because we just let the horses go for it – side by side galloping – it was so much fun! A great way to end my Patagonian riding adventures. A fabulous ride cantering across pampas and trotting through “Robbin Hood” Beech forests. Sipping Matte with our guide in a wee cabin – a really awesome day! Well here I am back in Internet land. El Calafate. So a quick review of fun times in El Chalten. The first day I hiked about 21 Kms up to this lake at the base of Mount Fitz Roy. The lake itself was pretty understated after the more beautiful ones I’ve seen down here however the hike was really pretty and easier than some I’ve done. The weather doesn’t look great but as I’ve said so many times, if it’s not raining cats and dogs sideways here, or snowing – the weather is good. It was actually pleasantly warm and there was hardly any wind – another rare bonus. Well I’ve discovered a place with worse Internet than remote areas of Nepal. Have had a couple of awesome days I’d like to tell you about and send you pictures of – but that may not happen while I’m here. “Here” being El Chalten in Argentina. Yesterday I started off on a two hour hike – which turned into six hours – not by accident but because the scenery was so incredible and huge I just couldn’t stop walking and investigating what might be behind the next rise. I walked up to Glacier Grande which is part of the great southern ice field… YES even after travelling all day by bus two days ago – the ice field continues to be present! Today I had a marvellous morning riding a huge black horse by name of Kan. Seems like a very understated name for such a cool horse. Hopefully pictures of both events will be coming to you soon! The riding was so much fun I think I’ll do that again instead of a hike. Currently it is raining and storming so hard! The rain is coming sideways and in great sheets. I’m so very happy to be in a really nice hostel siting on a comfortable couch with a hot cup of tea. Kinda wish they served food other than at breakfast. Soon I’ll need to brave the horrendous weather – by far the worst I’ve experienced on this trip – and acquire lunch. Hopefully without blowing away in the process. Check this out! This is the northern part of the great southern ice field. The third biggest ice field remaining in the world. Antarctica and Greenland are the only bigger ones. This ice field, pared with the Atlantic and Pacific oceans (which are so close to each other down here) are the great Patagonian weather makers. Today once again the weather being made was lovely, sunny and warm. Lucky us – four days in a row of sunny skies! So that’s a wrap on the trek blogs. An other major mountain feature in the park are these two “Horns” (Los Cuernos) which rise steeply out of two valleys to either side of them. We hiked up one – French valley – and watched some pretty impressive avalanches roar down from the glaciers above. Once again we had glorious weather in the afternoon after a cloudy morning! So at this point we were two for two great sights. Stand by for the next post to see what we saw next! OK here again is the dorm room shot that was supposed to be part of the last post.